Following a marathon negotiating session of European Council on the 26th of October in Brussels, Heads of State and Government of the Eurozone member states agreed on a comprehensive set of measures which reflect their unwavering determinationto overcome together the current difficulties and to take all the necessary steps towards a deeper economic union commensurate with their monetary union. In particular on Greece, there was an agreement that should secure the decline of the Greek debt to GDP ratio with an objective of reaching 120% by 2020. It also includes a voluntary contribution by private creditors, amounting to a nominal discount of 50% on notional Greek debt. Additionally, a new EU-IMF multiannual programme financing up to € 100 billion will be put in place by the end of the year, accompanied by a strengthening of the mechanisms for the monitoring of reforms implementation. “The debt is absolutely sustainable now,” Papandreou told a press conference, earlier today, after the meeting of euro zone leaders. “Greece can now settle its accounts with the past, once and for all. […] We can claim that a new day has come for Greece, and not only for Greece but also for Europe,” the premier added. 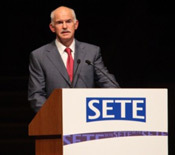 Prime Minister George Papandreou attended the EU Eastern Partnership Summit, held in Warsaw on September 29-30. 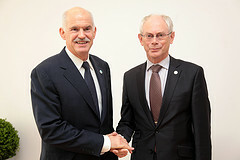 Addressing the summit, Papandreou urged his European partnersto explore ways of institutional cooperation that would help promote stability and prosperity in both the eastern and southern zones of the European Neighbourhood Policy. 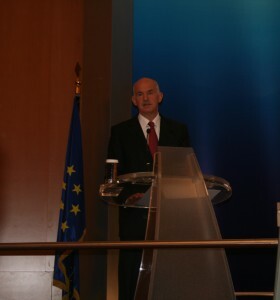 Papandreou proposed that the summit establish a small number of realistic and shared short-term and long-term targets, especially in areas of heightened interest that had a tangible impact on citizens, such as mobility, visas, tourism and energy. “We will then be able to focus on their effective implementation for our mutual benefit,” he said, adding that too ambitious a programme could become counter-productive. Η Σύνοδος για την Ανατολική Εταιρική Σχέση πραγματοποιήθηκε στη Βαρσοβία στις 29 και 30 Σεπτεμβρίου, στο πλαίσιο της Πολωνικής Προεδρίας της ΕΕ. Στη Σύνοδο συμμετείχαν εκπρόσωποι 33 χωρών, μεταξύ των οποίων τα 27 κράτη μέλη της ΕΕ και οι έξι χώρες της Ανατολικής Ευρώπης και του Νοτίου Καυκάσου: Αρμενία, Αζερμπαϊτζάν, Γεωργία, Μολδαβία, Ουκρανία και Λευκορωσία. Την Ευρωπαϊκή Ένωση εκπροσώπησαν οι Πρόεδροι του Ευρωπαϊκού Συμβουλίου, Herman Van Rompuy, του Ευρωπαϊκού Κοινοβουλίου, Jerzy Buzek, της Ευρωπαϊκής Επιτροπής, Jose Manuel Barroso και η ύπατη εκπρόσωπος για την εξωτερική πολιτική και την πολιτική ασφάλειας, Catherine Ashton. Η Ανατολική Εταιρική Σχέση (ΑΕΣ) αποτελεί ευρωπαϊκή πρωτοβουλία που αφορά στη συνεργασία των προαναφερθέντων 6 χωρών της Ανατολικής Ευρώπης. Την Ελλάδα εκπροσώπησε ο πρωθυπουργός Γιώργος Παπανδρέου. Στο περιθώριο του δείπνου εργασίας στις 29 Σεπτεμβρίου, ο πρωθυπουργός Γ. Παπανδρέου είχε συνομιλίες με τους πρωθυπουργούς της Γαλλίας Francois Fillon, της Ισπανίας Jose Zapatero, της Πορτογαλίας Pedro Coelho, της Ιρλανδίας Enda Kenny, της Εσθονίας Andrus Ansip με την γερμανίδα καγκελάριο Angela Merkel, με τον αντιπρόεδρο της βρετανικής κυβέρνησης, Nicholas Clegg, με τους Προέδρους της Ουκρανίας Viktor Yanukovich, και της Γεωργίας Mikheil Saakashvili. Στις 29 Σεπτεμβρίου ο πρωθυπουργός είχε, επίσης, συνάντηση με τον Πρόεδρο του Αζερμπαϊτζάν, Ilham Aliyev, με τον οποίο συζήτησε ενεργειακά και οικονομικά θέματα, καθώς και εθνικά θέματα, όπως το Κυπριακό. Στο περιθώριο της Συνόδου στις 30 Σεπτεμβρίου, ο πρωθυπουργός Γ. Παπανδρέου συναντήθηκε με τον Πρόεδρο του Ευρωπαϊκού Συμβουλίου, Herman Van Rompuy, με τον οποίο συζήτησε μεταξύ άλλων για την πορεία της ελληνικής οικονομίας και την υλοποίηση των αποφάσεων της 21ης Ιουλίου. Συναντήθηκε, επίσης, με την πρωθυπουργό της Σλοβακίας Iveta Radicova. 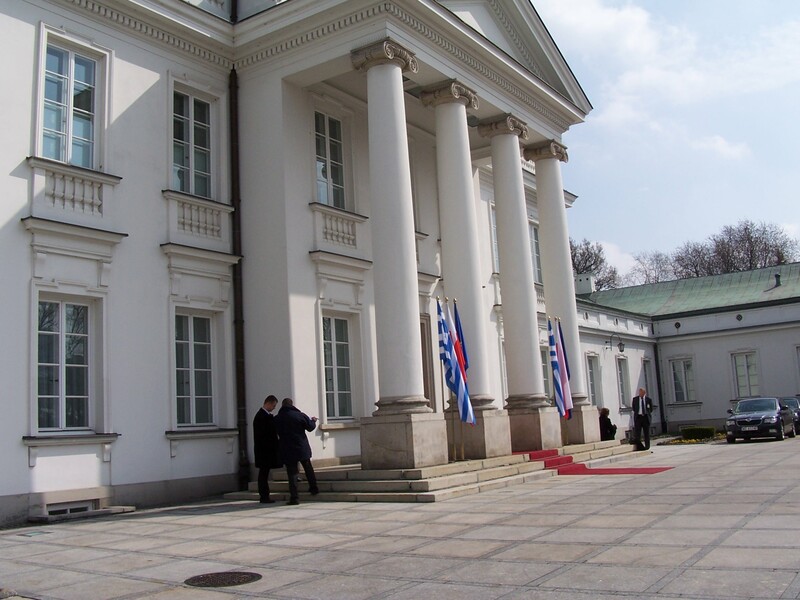 Government Vice-President and Finance Minister Evangelos Venizelos attended informal Eurogroup and Ecofin meetings in Wroclaw, Poland, on September 16-17. Speaking to reporters following the meetings, Venizelos said he briefed the Council over decisions taken by the Greek government to achieve fiscal targets for 2011 and 2012, and towards reaching primary budget surplus the soonest possible. Meanwhile, following a meeting of the governmental committee in Athens, yesterday, chaired by Prime Minister George Papandreou , Venizelos said that the Government takes full responsibility for the implementation of the agreed programme, but this responsibility must be also taken by all European institutions, all member-states, because the July decisions, the decisions of the European Council have an existential significance for the Euro Area. 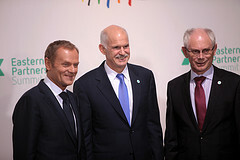 Prime Minister George Papandreou visited Poland on April 7 for talks with his Polish counterpart Donald Tusk and the country’s President Bronislaw Komorowski, in view of the Polish presidency of the EU, during the second term of 2011. The two Premiers discussed the priorities of the Polish Presidency, especially in what concerns the Common Agricultural Policy, migration, as well as developments in the Middle East. 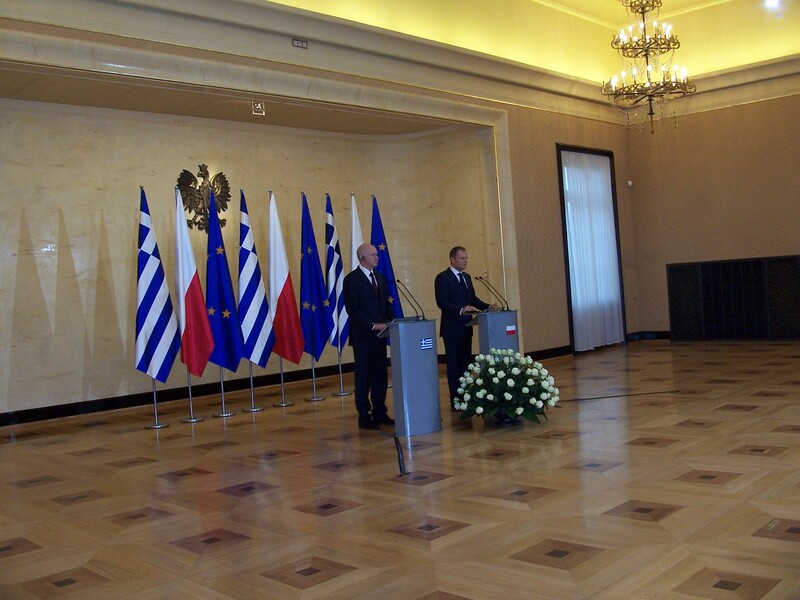 Papandreou also made a special reference to his great-grand father’s Polish origins and the flourishing Polish community in Greece.